RTV or direct vulcanized molds of low temperature silicone rubbers (180oF , 82oC). Photo Polymer for use in all Asiga 3D systems using 405nm emitters. Asiga manufactures general modeling photopolymers for the Pico, Pico2, Pro and Pro2 as well as the new Max series of machines. Note: There is no tray included. Purchase trays in "Consumables" section of shop. General purpose pink material. Suitable for use in RTV molds or directly manufactured parts. PlasPINK is a high resolution photopolymer offering excellent clarity and surface finish. 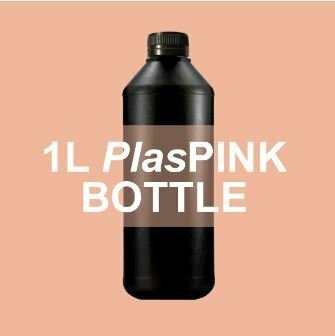 PlasPINK can be directly molded in RTV or low-temperature vulcanized rubber. If making vulcanized molds, you must dip the RP parts in Jett-Dri nanoparticle Teflon material so that it is easily removed from the cut mold.